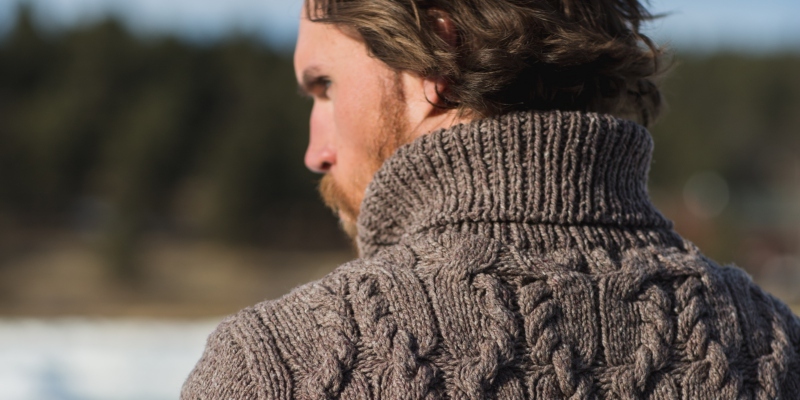 Interweave Knits Winter 2018 features this knitted cable story and more! Pick up your copy today and get the full experience of our most current edition. 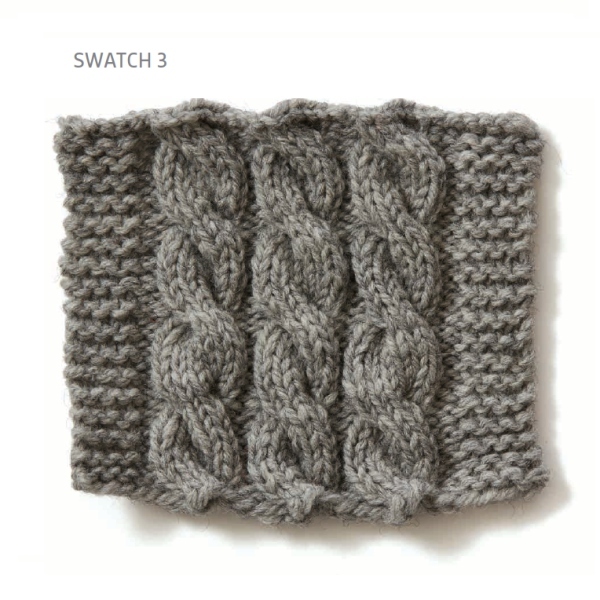 You found a knitted cable pattern you love, knitted a swatch to make sure the yarn and pattern are compatible, and started your project. But after working the cable pattern for a few inches above the garter-stitch border, you notice that the side edges are starting to draw in, causing the corners to flare out. Even worse, the lower border has an unplanned-for ruffle, ruining the look of your project. These are all the results of the dreaded cable flare. Swatch 1 shows cable flare at its worst. The top and bottom borders are ruffled, the side borders are pulling in, and the corners are flaring out. So how can you avoid these problems? In this article, I’ll explore three different situations in which cable flare might occur and offer possible solutions for each. 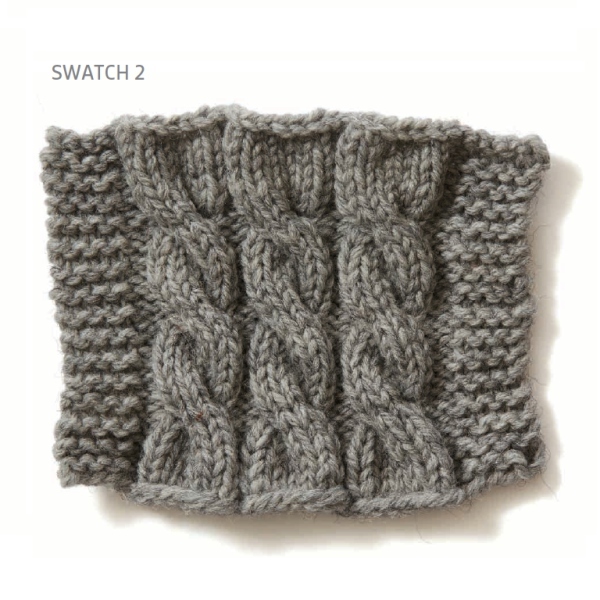 In Swatch 2, the knitted cables cross every eight rows, with the first crossing occurring on Row 8. 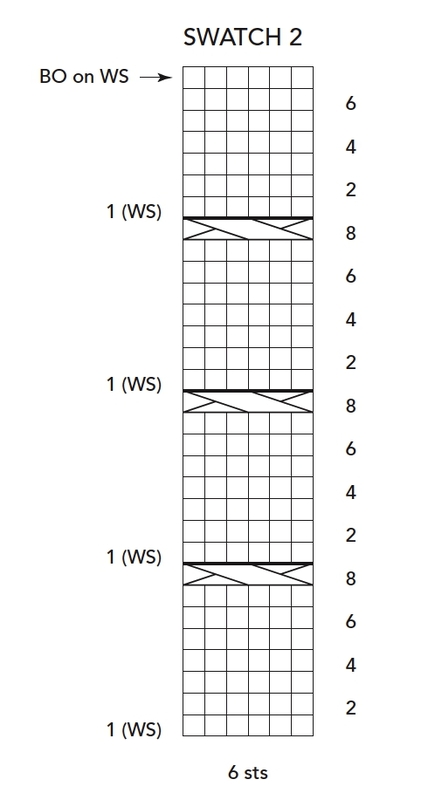 To balance the cables vertically, Rows 1–6 were worked after the last crossing row and the stitches were bound off on Row 7 of the cable pattern. The three cable crossings cause the side borders to contract in the center; the top and bottom edges flare out because there are no crossings to draw in the fabric. Redistribute the cable crossings so that the first and last crossings occur closer to the bottom and top edges, thus eliminating the rows of fabric that have a wider gauge. 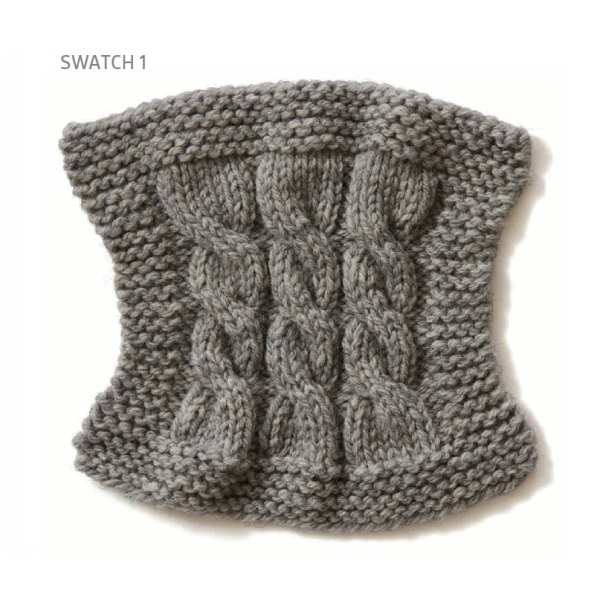 In Swatch 3, the cable crossings occur on Row 2 of the eight-row repeat and the stitches were bound off on Row 3 of the last repeat. This approach may require changing the total row count slightly to accommodate the different distribution of the cables. Crossing the cables near the cast-on and bound-off edges doesn’t work for certain designs, such as patterns that start with a few inches of ribbing. In these situations, you’ll need a different solution to cable flare. 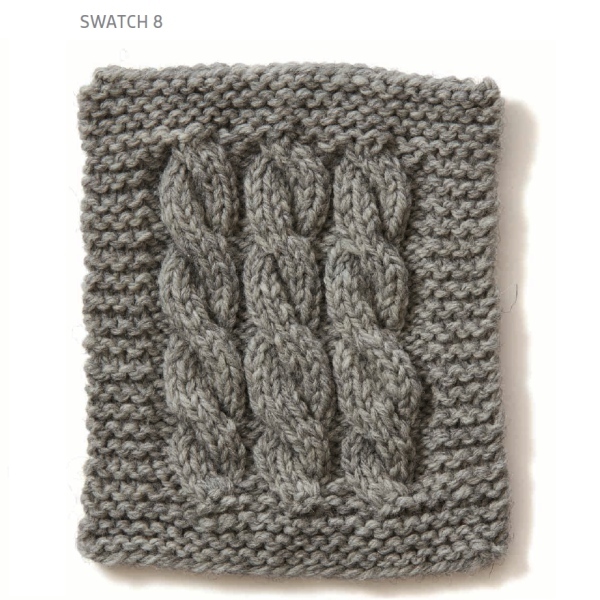 Swatch 4 shows a reversible cable pattern with several rows of k1, p1 ribbing worked before the first crossing row and after the final crossing row. As with the previous swatches, the edges ruffle and flare because of the different gauge at the cast-on and bound-off edges. Work the ribbing with a smaller needle than the one used for the cable pattern—a classic gauge-reducing maneuver. 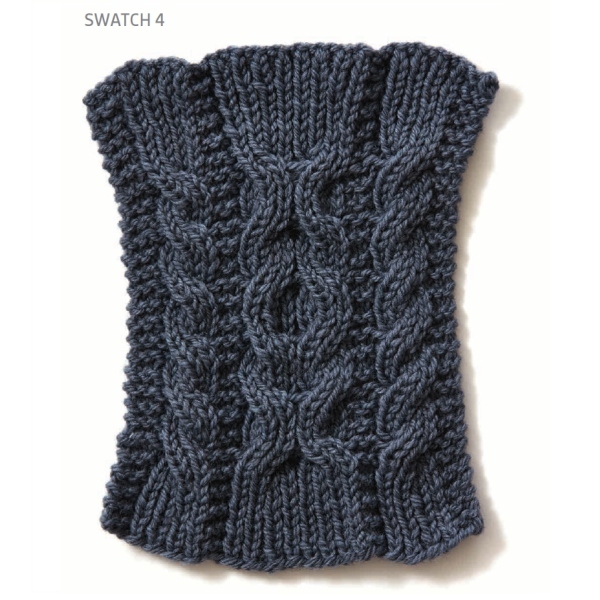 In Swatch 5, both the initial ribbing and the final ribbing were worked on a needle two sizes smaller than the one used for the cable pattern. If the difference in gauge between the border pattern and cable pattern is too great, simply using a smaller needle for the border may not be enough to combat the flare. In these cases, the solution requires some swatching and a little math. 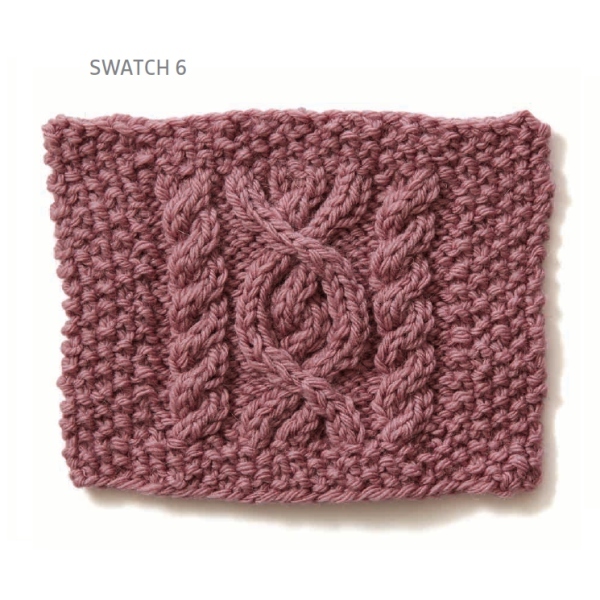 For example, imagine that you want to knit a cabled scarf with seed-stitch borders on all four sides, like the one shown in an abbreviated form in Swatch 6. You’ve selected a cable 12 stitches wide to run up the center, flanked on either side by 4-stitch rope cables. The cables and borders are separated by vertical columns of 2 purl stitches each. The seed-stitch borders at each side are 5 stitches each, for a total of 38 stitches: 28 stitches in the cable pattern and 5 border stitches on each side. Because the gauge over the seed stitch is larger than the gauge over the cables, the borders above and below the cables need fewer than 28 stitches to achieve the same width. But how many stitches fewer? 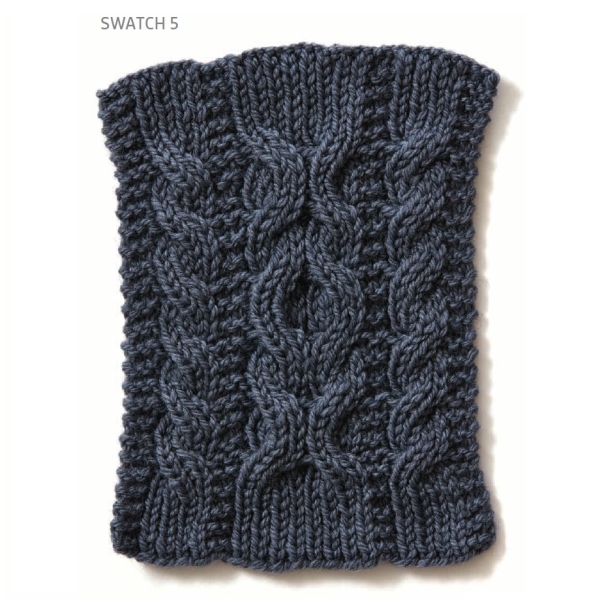 Enter the gauge swatch! Swatch 7 shows what a gauge swatch for this project might look like. It includes the 12-stitch center cable, a 4-stitch rope cable, and three pairs of separating purl stitches (22 stitches in the cable pattern total). On the left edge of the swatch are a few seed stitches to prevent the swatch edge from rolling; to the right is enough seed-stitch fabric to measure the gauge (15 stitches). To calculate the width of the cabled area of the scarf, measure the width of the 22-stitch cable pattern on the gauge swatch (2.875″ [7.3 cm] wide on the sample swatch) and add the width of another rope cable plus a 2-stitch purl column (1″ [2.54 cm]). The 28-stitch cabled area of the scarf will be 3.875″ [9.84 cm] wide (2.875″ [7.3 cm] + 1″ [2.54 cm]). Next, calculate the stitch gauge per inch of the seed stitch. 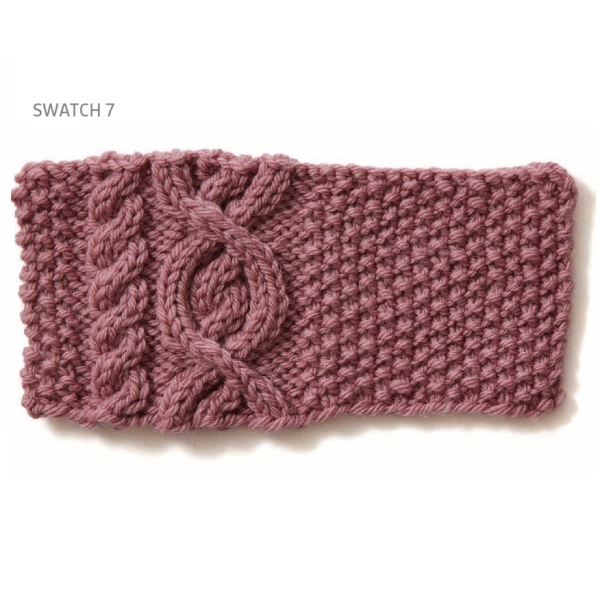 On the swatch, the seed stitch measures 2.875″ [7.3 cm] across 13 stitches (edges can distort gauge, so exclude these stitches). Divide 13 stitches by 2.875″ [7.3 cm] and you get 4.5 stitches per 1″ [2.54 cm]. Multiply the width of the cabled area in the scarf by the stitch gauge per inch of the border pattern: 3.875″ (9.84 cm) Å~ 4.5 = 17 sts. Add the 5 border stitches on each side and you have the number of stitches to cast on for the scarf: 5 + 17 + 5 = 27 cast-on stitches. On the last row of the lower border, you need to increase 11 stitches over the center 17 stitches to get to 28 stitches, and then decrease 11 stitches in the first row of the top border to get back to 17 stitches. To preserve the continuity of the border pattern, no increases or decreases are worked within the 5-stitch side borders. If the difference in stitch counts between the border and the cabled area requires an unworkable number of increases and decreases, consider working the top and bottom borders using a needle two sizes smaller, as with the reversible cables. You’ll cast on more stitches on the smaller needles, which means you will need to increase fewer stitches when you transition to the knitted cable pattern on larger needles. So is all this planning worthwhile? Well, compare Swatch 8 to Swatch 1 and you can see what a difference these techniques make. The results speak for themselves. Find More in Our Store!